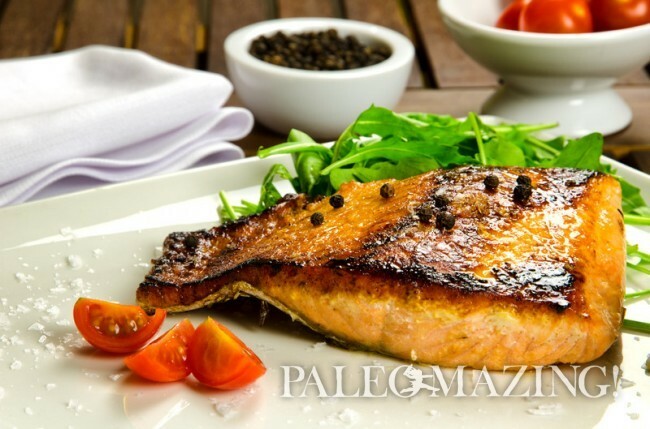 I love this paleo maple salmon fillets recipe as it is not overly sweet, yet the flavors blend and enhance the fish. Many recipes call for so much sweet and sour that I cannot enjoy the underlying protein. That is not a good recipe to me. I want to taste it all! If you have spent the money on a good fillet or fish, you need a recipe that works with your protein at hand, In this case, your fish. Salmon from the Pacific coast is still some of my absolute favorite. I love to buy a large fish fresh off the boats, at the Seattle Pier, Pikes Place Market. The best! I also have to say that this is such a delicious way to treat yourself to the amazing health benefits of Omega-3 oils! Serve these fillets with my Paleo Fruit Summer Platter for a perfectly fresh primal meal during any season. After you enjoy your salmon, serve up a delicious dessert of Paleo Dark Chocolate Bacon as a little treat to finalize the evening. You will be in heaven form start to finish. I love this recipe as it is not overly sweet and yet the flavors blend and enhance the fish. Many recipes call for so much sweet and sour that I cannot enjoy the underlying protein. That is not a good recipe to me. I want to taste it all! If you have spent the money on a good fillet or fish, you need a recipe that works with your protein at hand, In this case, your fish. I gave you two options below for this one dish. Each tastes slightly different yet both are SO EASY! Rinse and dry your salmon fillets. Rub each with a lemon wedge. Brush 2 teaspoons pf oil on the flesh side of the salmon (to help seasoning adhere). In a bowl, mix the nutmeg, cinnamon, garlic powder, salt, onion powder and black pepper. Sprinkle each fillet with your homemade spice mix. Let sit covered in fridge for 1 hour. In a saucepan, mix together the soy sauce and maple syrup over medium heat until sauce is thick enough to coat the back of a spoon (about 7 to 10 minutes). At the same time, heat skillet and coat bottom with 2 teaspoons of oil. When oil is hot, place salmon in skillet, flesh side down, and cook over high heat for about 4 minutes or until brown. Pour the sauce/marinade over the newly exposed sides of the fillets and cook another 4 minutes with the sauce on top. This will then cook like a glaze, slightly caramelizing the soy sauce and maple syrup. Remove and garnish with peppercorns and pour remaining “cooked” sauce over the fish, if you’d like. OPTIONAL: you can reserve the sauce/marinade and pour it on top of the fillets after they finish, if you'd like. This is a fun option to the above dish and will actually taste slightly different. I do hope you enjoy both options. I love them served both ways. Your recipe says the syrup and balsamic will be carmelized, but there is no balsamic listed in the ingredients. You are right. It is meant to say soy sauce, not balsamic. Thank you. This has now been corrected. No I don’t have videos for these. Please do let me know if you have any questions though – I’d be happy to help you! 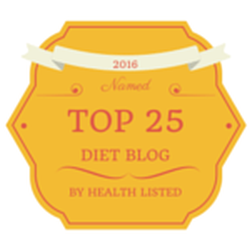 I try a LOT of paleo recipes that I find online …. hands down, this is the best one I’ve ever made. Making it again tonight, as a matter of fact! Thanks for posting it. Wow thank you for the compliment – I know there’s many recipes available online, and I’m very pleased that you’re enjoying this one. This was too sweet for us. Won’t be making again. How much maple syrup did you use? In the future you may omit the syrup if you wish, even though it is a maple salmon recipe. My family can’t eat garlic so I replaced it with 1 1/2Tbls of lemon pepper and added an extra 1/2Tbls of onion powder. Everyone LOVED it!! Thank you so much for making Paleo family friendly!! That’s wonderful! I’m glad you and your family enjoyed the recipe sans the garlic! I love to hear creative spins on my recipes. Thanks for sharing. Do you have the nutritional values per serving, please ? I am sorry but I do not have the nutritional value for this recipe. Sometimes I spend the time to find that but primarily my focus is just on creating healthy recipes in the kitchen. Sorry again for this!